Andrew and Tricia Hood purchased a run down property in 2003 and needed to replace some gates. 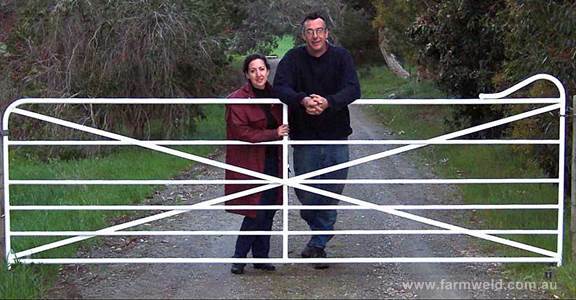 The range of farm gates on the market was limited to either contemporary pipe gates or mesh field gates and were generally imported, poorly made, and potentially unsafe for stock and humans. They didn’t want gates which had built in redundancy, they wanted something that would last. Not finding any suitable farm gates for sale they made the decision to make their own gates and animal handling equipment which was strong and safe. Having odd sized gateways, it was obvious that others must be in the same predicament where standard gates wouldn’t fit. 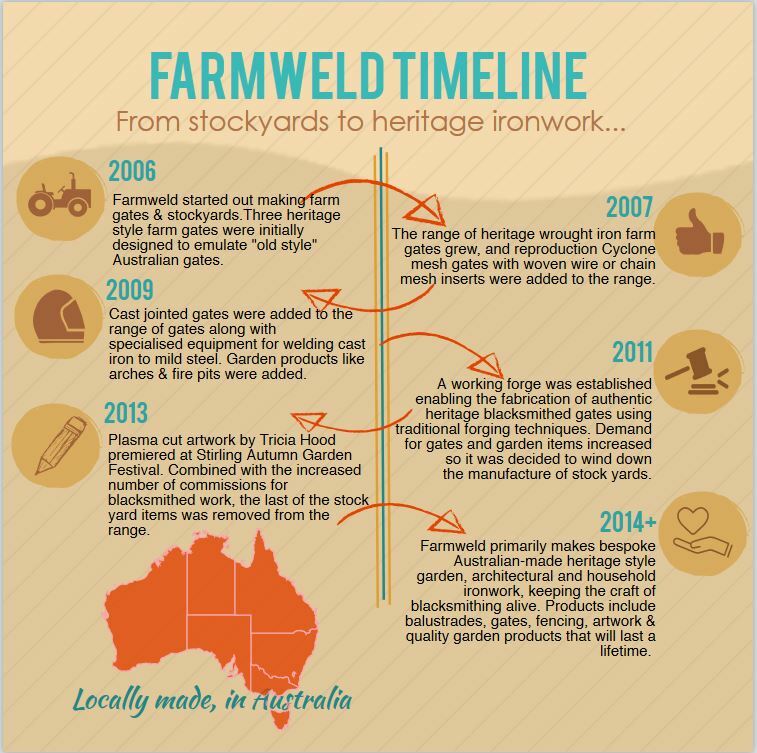 In 2006 prototypes were developed and they started up Farmweld. It was decided that all products would be custom made to suit their customers needs. In a way this was also a step in going back to the way businesses used to operate where customers were serviced, rather than just having to just conform to what was available in stores, as seems to be the way these days. The initial range of products consisted of mainly agricultural gates & equipment, but three ‘heritage style gates’ were designed and were selling well. More gates were designed and demand continued to grow. Scrollwork was used a lot on old gates and mesh & scroll gates were the next to be added to the range, emulating the old Cyclone gates. As Farmweld’s reputation for heritage gates became more prominent Andrew decided to expand his metal working skills into blacksmithing as many metal gates pre-1900 were hand forged. Farmweld has one of the most comprehensive collections of blacksmithing equipment. With the help of a 200cwt Massey power hammer, Farmweld is able to cater for very large wrought iron projects as well as small. Why should I buy a Farmweld Product? almost every item is custom made to the customers specifications. Why make do and just buy off the shelf when you can have something made exactly as you need it? Old fashioned customer service and reliability seems to be a dying trait these days. We value our your business and make it a high priority to provide you with good customer service so that you get the product you really need. As a Farmweld customer you will be consulted before and if necessary during fabrication to ensure you get just what you require. The “proof is in the pudding”, check out the testimonials and what our customers have to say.